One more for Lego® fans: the Japanese Design Store 25Togo has designed this beautiful piece of art: the Lego Lamp. As you can read on their website, the acrylic block is composed by two pieces: the base (LED illuminated), and the top block, which can also be used as a stationary holder. This brilliant lamp is available at the 25Togo online store and can be purchased for just ¥1600 (approx. £7.60). 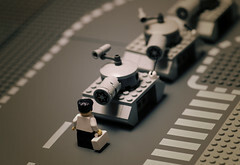 Balaktov (Mike Stimpson) is a very talented photographer, who have recriated some photography classics using LEGO® pieces. As a LEGO® fan since… hummmm… a long time ago, I’ve really enjoyed this amazing selection of classics.